Dear reader, please bear in mind that news about VC10s is sparse. I don't expect many news items, on the other hand... you never can tell, so be sure to check frequently. For the latest news please keep an eye on the VC10 forum and the A Little VC10derness Facebook page as items of interest sometimes turn up at these locations first, before these pages are updated. Scroll to the bottom of this page for archived news items. The Cosford Food Festival will take place on 20 and 21 July 2019. A line-up of local producers will be at the food market, serving up tasty food and providing various cooking demonstrations. The backdrop for the stalls will be the resident Hercules and VC10 C1K XR808. A new experience will be the Gin Flight Masterclass on board the VC10. During a 45 minute session you will learn about gin and have a gin tasting on board the aircraft. In a way, you will be reliving a bit of the famous VC10 on board service. Matt Birch's Visual Approach Images site now includes a story and a photographic overview of his involvement with the VC10. He has been taking great photographs for many years, and fortunately for us, he was able to get a close up view of 101 Squadron's operations during several trips between 2007 and 2009. 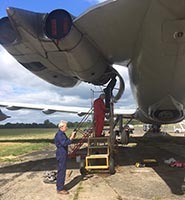 Thanks to a civilian ATC liaison programme Matt was able to fly on his favourite airliner of all time, and take some great photos of the military air-to-air refuelling operations that the VC10 provided. He was also present for the last two VC10 landings, ZA150 at Dunsfold and ZA147 at Bruntingthorpe in September 2013. Click here for his story and some great photos. The British Overseas Airways Corporation: A History by Graham M. Simons is a new title from Pen and Sword publishing and covers the entire story of BOAC's war years, growth throughout the post-war decades, until the merger with BEA that led to British Airways. This book covers both the political angles and the different operational issues that troubled the airline. It is lavishly illustrated with many period photos and images from BOAC promotional material and contains a very readable account of the airline's career. The author has extensively researched BOAC's history and the book is packed with facts and details in its 313 pages. Look no further if you want a complete overview of BOAC's glory years. Click here to view more details on Amazon.co.uk. LAKER: The Glory Years of Sir Freddie Laker by Ania Grzesik and Gregory Dix has been published recently by Recursive Publishing and is a very complete account of Sir Freddie Laker's life and business dealings. It is available from the publisher or The Aviation Bookshop, I haven't been able to find it through any of the regular online bookdealers yet. You'll get a hefty tome containing almost 600 pages, three galleries with a lot of images, and a new look at the pioneer of the low-cost North Atlantic service model. 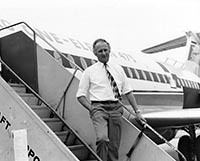 Co-author Greg Dix has been with Sir Freddie for more than 20 years throughout the tumultuous period that culminated in the demise of Laker Airways. Together with Ania Grzesik he provides a new look at this inspirational businessman. Click here for more details on the publisher's website. On 26th January the cockpits of XV109 and XV104 were transported from Bruntingthorpe to St. Athan, where they will become part of the South Wales Aviation Museum. XV109 is a complete nose section while XV104 is somewhat smaller, having been cut off just below the flight deck floor. XV104's flight deck will be used as a travelling exhibit this next Summer, travelling to RIAT and other airshows to raise funds for moving ZA147 to St. Athan. Another option in the Christmas presents category is a keytag from Aviationtag.com. This German company specialises in tags, which can be used for keys, luggage or just as a memento, created from old bits of aircraft skin. So what you're getting is a small piece of aluminium that used to be part of a specific aircraft, and the tag itself is marked to reflect this. The tag may also include small blemishes that were once part of the aircraft itself. 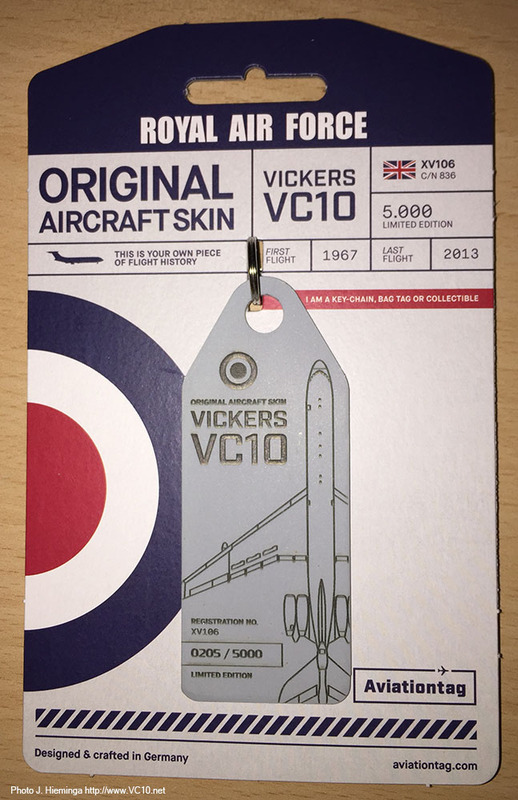 The interesting tag in their collection is one from a run of 5000 (for obvious reasons all these tags are limited editions) created from VC10 C1K XV106. 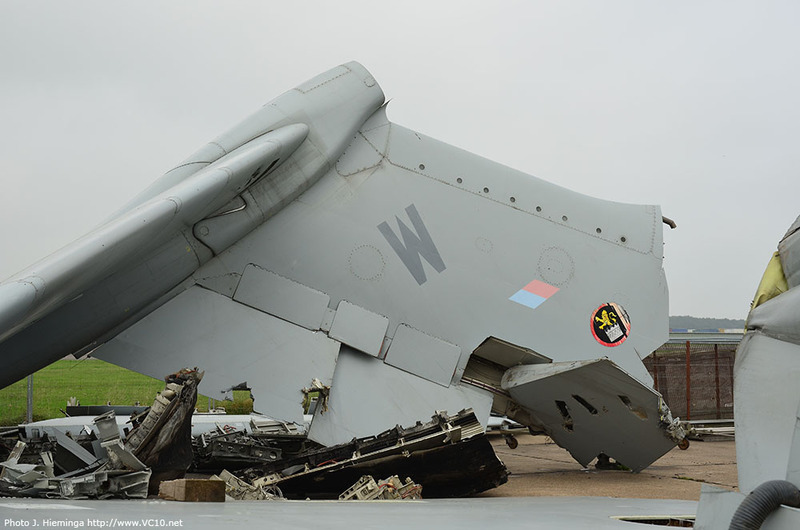 After XV106 carried out its last landing at Bruntingthorpe on 7th November 2012, the aircraft was stored at the airfield while parts were recovered, until the airframe was cut up in August 2013. The nose section was stored and moved to the Avro Heritage Museum in September 2016, but apparently some other (smaller) bits of metal found its way to Aviationtag.com. The end result is an affordable and distinctive memento of this particular C1K and the RAF VC10 fleet as a whole. See this link for more details and the Aviationtag.com online shop. This was not the end of XV106, small bits have been repurposed as keytags. The end result, a neatly laser engraved bit of aircraft skin. If you're looking for some VC10 footage, there are several options out there. Producer Avion Video has just released a new title: 'Classic Airliner Collection no.3', available on DVD from their website (see link above). Just as with the previous two titles in this range, the DVD contains many short scenes showing classic types from the 1950s to 1980s at US and European airports with one sidestep to Kuwait showing DC-3s in the 1950s. The final sixteen and a half minutes of the hour long DVD is dedicated to RAF's 10 Squadron in the mid to late 1980s though. A mini-documentary shows scenes from around RAF Brize Norton, including the VC10 simulator and the base hangar. It also shows the VC10 from various angles and then goes along on a trip to Ascension Island via Dakar and back home, showing all aspects of the flight. As an alternative, Henry Tenby's online TV channel Jetflix has just released 'RAF Brize Norton 2011 - VC10 L-1011 Superbase'. This video was created by spending three days filming around the airfield, mostly from the perimeter road under the final approach, showing many of the training sorties that were a daily task for both 101 Squadron's VC10s and 216 Squadron's Tristars. Have a look on the website for more details. Other interesting videos on Jetflix include a three-part tour of Brooklands Museum including their VC10, and a visit by C1K XV104 to Vancouver in 2011. The VC10 may also be included in some other shows, such as an early 1970s look at the Seychelles. The 24th issue of The Aviation Historian, available from their website through the link above, includes an article based on official files about the names that were considered for the VC10. Chris Gibson has uncovered the story of how several departments sent proposals back and forth, eventually ending up with the single RAF type that never carried a name. The article is nicely illustrated with several period colour photos of RAF VC10s. While ZD241 braved a rainy day to run up and down the Bruntingthorpe runway, the Wings & Wheels event at Dunsfold saw some better weather (at least on the Saturday) and ZA150 celebrated this with a two engine run. The port side engines, including the recently repaired no.2 Conway, were run in front of an appreciative audience. Thanks to Toby Vickers here's a video of this run (take care with the volume adjustment please). 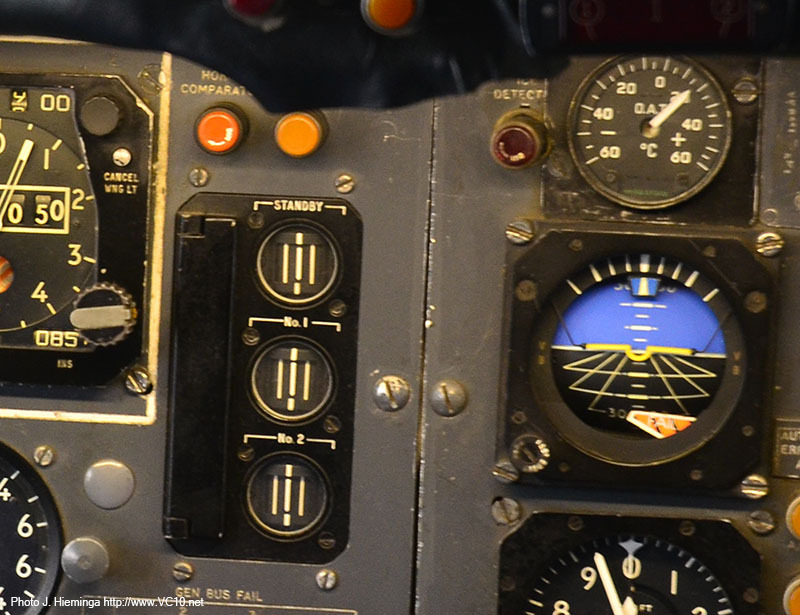 "During the June VC10 open day on ZA150 at Dunsfold the operating crew experienced a very stiff no.2 throttle lever. 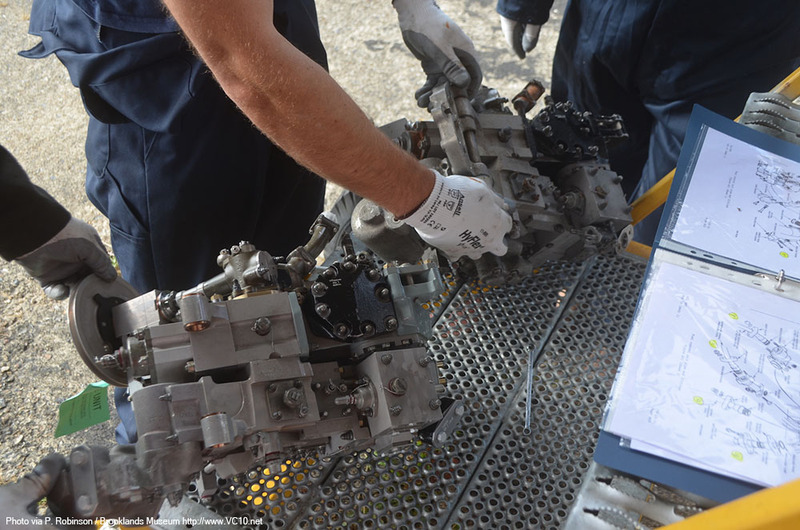 On the subsequent maintenance day the team commenced troubleshooting the entire cable run from the cockpit to the Fuel Control Unit (FCU) on the RR Conway engine. It didn’t take long to identify that the cause of the problem was internal to the FCU which, if we didn’t have a spare, was a show stopper for no. 2 engine. A spare, including the required seals, was found amongst the spares that came from RAF Mount Pleasant in the Falklands. The pressure was now on to replace the FCU before Wings & Wheels on 25/26 August. Over a couple of days in early August three of the team set about replacing the FCU and getting doused in Jet A1 fuel in the process. When I went home smelling of jet fuel it took my wife back down memory lane to when we were first married. The last time two of us had replaced a VC10 FCU was in excess of 30 years ago! For the third team member it was a little more recent as he is ex-RAF. The change went very well with no fuel leaks after installation followed by a successful engine run. Some thanks should also go to the Bruntingthorpe ZD241 group who offered advice as some of that group were VC10 engineers up to the VC10’s retirement." This means that ZA150 is ready for next weekend's event, see here for details: Dunsfold Wings & Wheels. Next Sunday is also one of Bruntingthorpe's two yearly open days, so if all goes well, two VC10s will run on the same day. It has been a while since I posted about ZA147, and now I can add some good news. The Facebook group linked to above was set up recently to inform everyone about plans to take ZA147 apart and organise a road move to St. Athan in Wales. GJD Services has all the experience, tools and manpower needed to organise this move, just as they have done for XR808. You can help out by supporting this move financially, by buying £10 shares. There will also be a VC10 membership club with various perks available for an annual fee. There is a lot of money to be raised before the move can get started, but the goal is attainable and it will secure a future for this VC10, as a ground running example of this great airliner. A website will be set up soon and more details will become available. 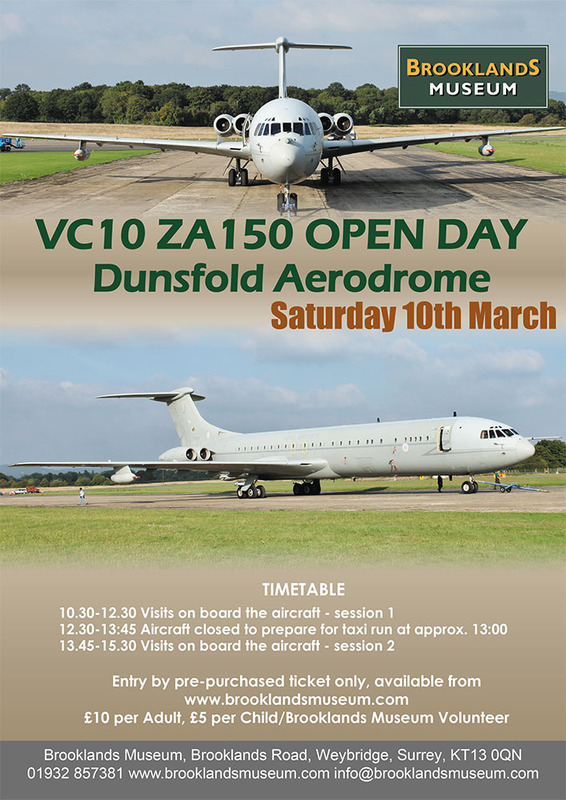 The next open day at Dunsfold aerodrome for resident VC10 ZA150 will take place on 7th July. Tickets must be booked prior to the day for either the morning or afternoon session and the number of tickets is limited. Visitors will be able to view the aircraft close up, including inside, and ZA150 will perform a low-speed taxi run. See the website through the link above for more information and to buy tickets. On April 1st, the 100th anniversary of the birth of the Royal Air Force, a statue commemorating Thomas Mottershead VC was unveiled in the town of his birth, Widnes. A charity appeal has been raising funds for this for several years now and the end result is a great looking life-size statue, which was unveiled by his grandson, Colin, and Air Marshal Sir Roger Austin. See link above for a video from the event. On 24th February 2018, Captain Chris Orlebar passed away aged 73. Although well known as an expert on everything Concorde, and writer of one of the best-selling books about the supersonic transport (visitors to his flight deck often had the option of purchasing one as well), Orlebar joined BOAC in 1969 and flew the VC10 as a pilot, navigator and later instructor until he moved to the Concorde fleet in 1976. He was closely involved with the rebuild of G-BBDG at Brooklands Museum, often turning up to check on progress, or chatting with visitors and volunteers. At the 50th anniversary of G-ARTA's first flight he was one of the speakers, talking about what it was like to fly the VC10. On 24th September 2013 he turned up at Dunsfold in his blue MGB to welcome ZA150 after its final flight, shooting video of the whole event. 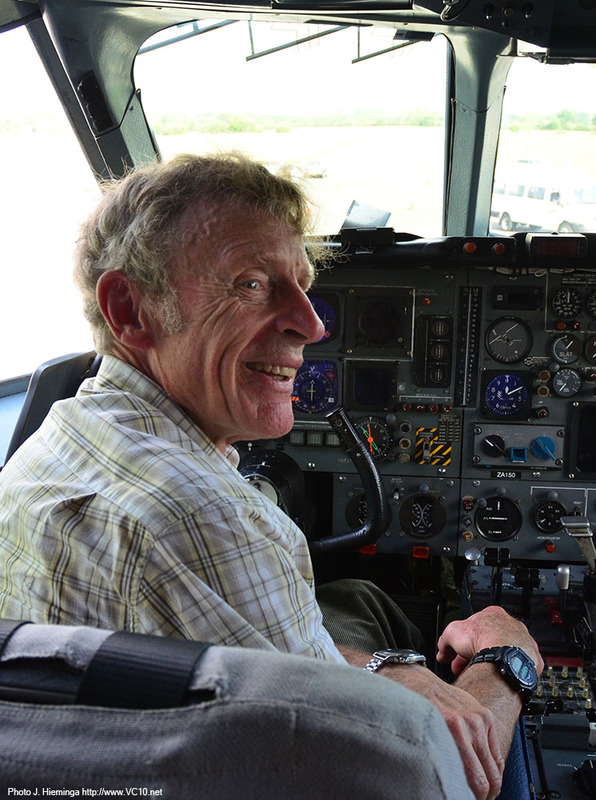 Not long after the landing he was in the cockpit, strapping himself into the captain's seat and chatting about what a great aeroplane the VC10 was to fly. For anyone looking for a new watch, you might be interested in this limited edition offering from British quality watchmaker Bremont. They are offering a special version of their MBII model with a customised face commemorating the VC10's military service. If a minimum of 15 orders is reached, they will start building these watches, which will take approximately 20 weeks. 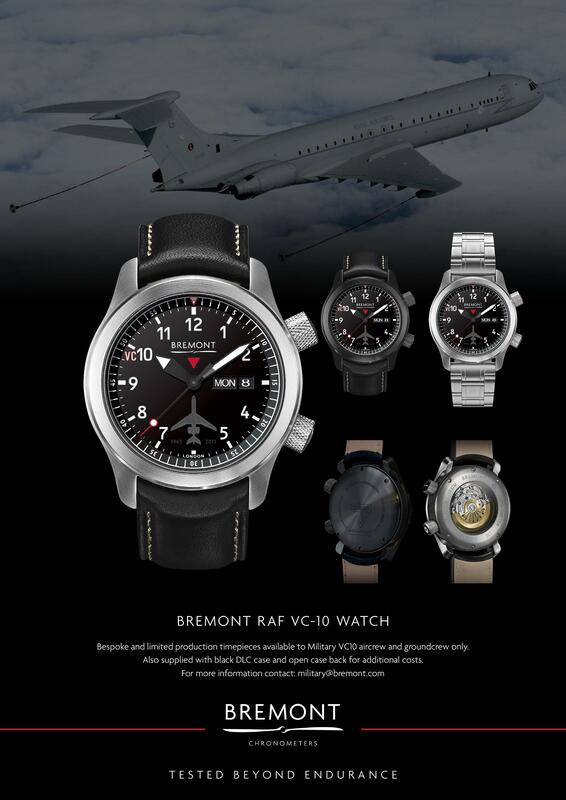 The normal MBII retails around £3795, but these limited edition watches will be available to military personnel who worked on the VC10 at a special price of £2055. Different colour watch cases, open backs and different bands are also available at additional cost. The watch face has a VC10 plan view with the years of the first and final flights next to it at the bottom, and a little addition at the 10 o'clock position. If the poster on the right isn't clear enough, click here for a full size version. For more details or to register your interest, get in touch with Chris Nash via e-mail (click here). Because of the special discount, only military personnel can get one of these watches. Have a look at the link at the top of this message for more information about the Bremont MBII watch. Every once in a while you want to read a bit about other aspects of British aviation history that are related to the VC10 story, but not as closely as other books mentioned on this site. Thanks to Amberley publishing I was able to get a look at three recent titles that offer a bit of background or context, along with some lovely images. While they don't add many details to the VC10's history, they do provide a good view of some interesting periods in British aviation history and are therefore worth mentioning here. Mostly a pictorial overview of the different operators and their types, as seen at airfields around Britain during the 1970s. While the first chapter is dedicated to BOAC/BA, and includes several VC10 photos, the rest of the book covers independent airlines, cargo operators, air taxi outfits and overseas airlines. Each chapter starts with a short text and continues with a lot of well-captioned images.This book is great if you want to get a view of what you would have seen at British airports before or after a VC10 flight in those days. The appendices include lists of operators and some numbers for passengers handled/carried, staff and flights flown by the various operators. Transport Command started in March 1943 and lasted until being renamed to Air Support Command in August 1967. 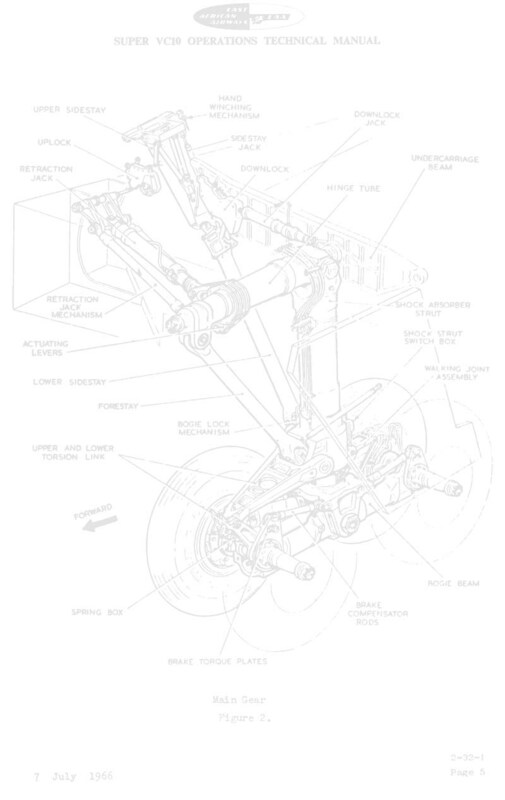 Keith Wilson, who also wrote the Haynes manual about the VC10, provides a concise but complete history of types, events and major operations during this period. The major part of the book is a pictorial history and shows some great images from different archives, including several from the Air Historical Branch that have not been published before. Only a small number of VC10 images, one of which (page 89) was taken at Wisley, not Brooklands as stated. 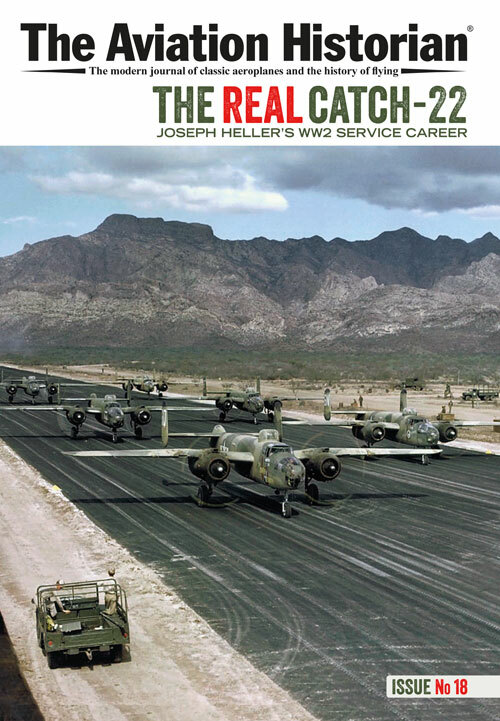 A well-written book that illustrates the story of air-transport by the RAF in a great way. The cover of this book shows a great image of the ex-Gulf Air and EAA VC10s being converted to tankers at Filton, but don't expect more than a mention of the program inside. What you do get is a comprehensive history of Bristol Aircraft, including the various production and test sites around Filton, with slightly smaller chapters about Parnall, the Gloucestershire Aircraft Company, or Glosters as it became, and various component companies such as Dowty, Smiths and British Messier. With more text than the other two books mentioned here, it still contains enough images to illustrate the story and contains a good overview of all the aerospace companies in the area and their activities over a long period, continuing until today's activities for Airbus. All three of these books are the same, roughly A5 sized, paperbacked format with just under 100 pages, or up to 124 pages for the third title. They are also competitively priced. Enjoy! If you want to get up close with a live VC10, there are two options coming up pretty soon. 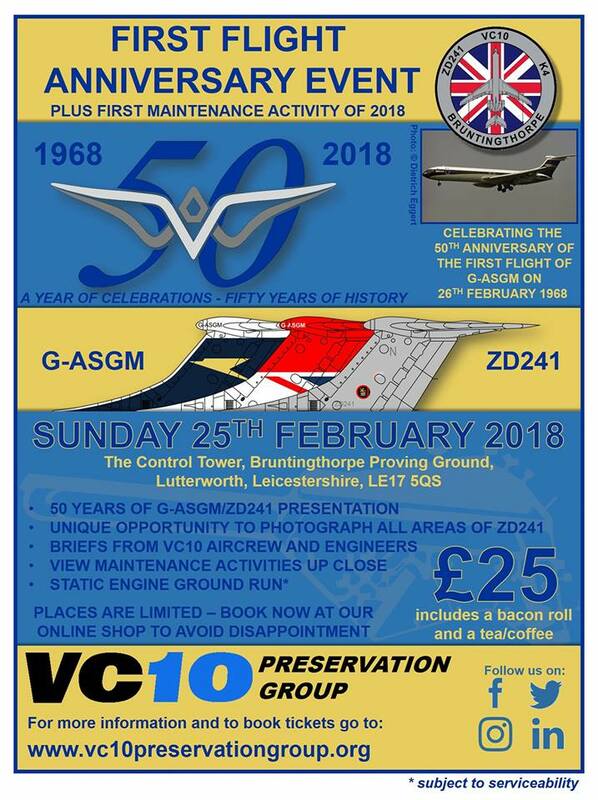 On Sunday 25th February the team at Bruntingthorpe will host an event to celebrate ZD241/G-ASGM's 50th birthday. Tickets are limited and available at £25 from www.vc10preservationgroup.org, which also happens to be ZD241's new website. More details can be found on the poster below, on the website and on the team's social media channels. On Saturday 10th March the team looking after ZA150 at Dunsfold Aerodrome will host an open day, including a taxi run and visits to the aircraft. The taxi run will be at low speed for fuel conservation (there’ll be some noise though) and subject to serviceability. Tickets are limited and available at £10 (adults) or £5 (kids) from www.Brooklandsmuseum.com. More details are on the poster below, the museum website or the team's social media channels. Working together with Aeroplane Heaven, Just Flight have just released the first of three VC10 packages. This includes a type 1101 Standard VC10 in ten different liveries, see the Fly a VC10 page or the link above for more details. Back in July, and again in October, G-ASGC was repositioned at Duxford so that it could star in a new ad. This has now been released and turns out to be the Christmas ad for Heathrow Airport, with the Heathrow Bears as co-stars next to the VC10. After some hard work VC10 K3 tanker ZA148, ex 5Y-ADA, now has its full set of Conways back. 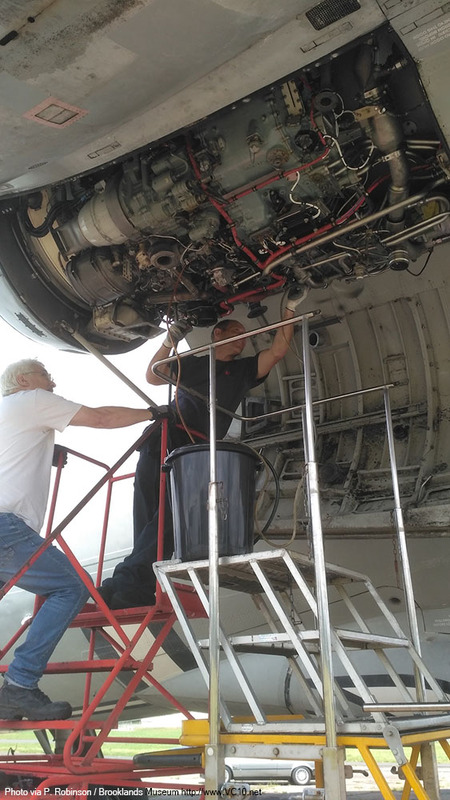 A team from the museum, led by Gary Farrar, spent several days getting the four engines back in the nacelles. 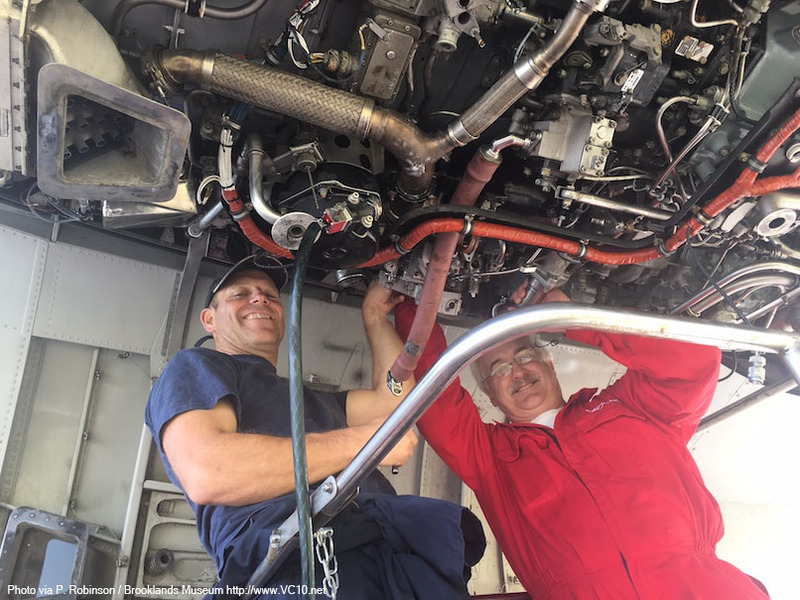 Supported by GJD Services they used the original engine hoisting kit to winch the Conways back up to the engine mounting beam, where four bolts per engine securely fix it to the airframe. For now the associated piping and cables have not been reconnected but as this can be done without the kit of special tools, the plan is to do this at a later stage. Theoretically the airframe could be brought back to ground running condition but the financing does not allow this right now. 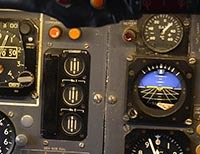 Ferranti Standby Artificial Horizon on the right. The Omani VC10 at the Brooklands Museum suffered a minor break-in on 23rd October and is now missing a standby Attitude Indicator from the flight deck. On behalf of the museum I would like to ask everyone to keep an eye out for a Ferranti Standby Artificial Horizon, as shown on the accompanying image. Hopefully it will surface somewhere so that it can be reinstalled on the aircraft. Thanks! Ideally the airframe could be moved to a museum in the UK that is willing to taken on the responsibility of looking after a complete airframe. GJD Services at Bruntingthorpe has the tools and knowledge to do this, having moved XR808 to RAF Cosford in 2015, but they cannot do this for free. So now is the time to think about possible homes for this record-breaking airframe and possible ways to collect the needed funds for a move. Please use the forum on my site, or the site's Facebook page to send in your suggestions. Alternatively use the e-mail link on the left to get in touch about this. On October 1st the BBC showed the first episode of a new miniseries about life in Aden in the mid 60s. The trailer (see below) for this series started off with a tantalising view of a BOAC VC10 with passengers disembarking. Although many speculations about the airframe used for this scene ensued on the internet, the truth turned out to be a clever use of CGI, although they should of course have removed the refuelling probe from the original model, which was obviously based on a RAF tanker variant. The Facebook page for BlackGinger, the South Africa based company that created the visual effects needed to put this shot together, shows a video with a breakdown of the creative process. Also on October 1st, the fourth episode of season 3 of BBC's series Outlander featured a take-off shot of a BOAC VC10, relabeled as North Atlantic Airways, with another shot showing of one of the series' stars in what looked a lot like a VC10 interior. The production company may have used the interior of G-ASGC for this, but may have used generic seats with coloured covers and a suitable backdrop as well. The outside shot appears to be based on period footage with some retouching to change the BOAC titles to those of the fictional airline. 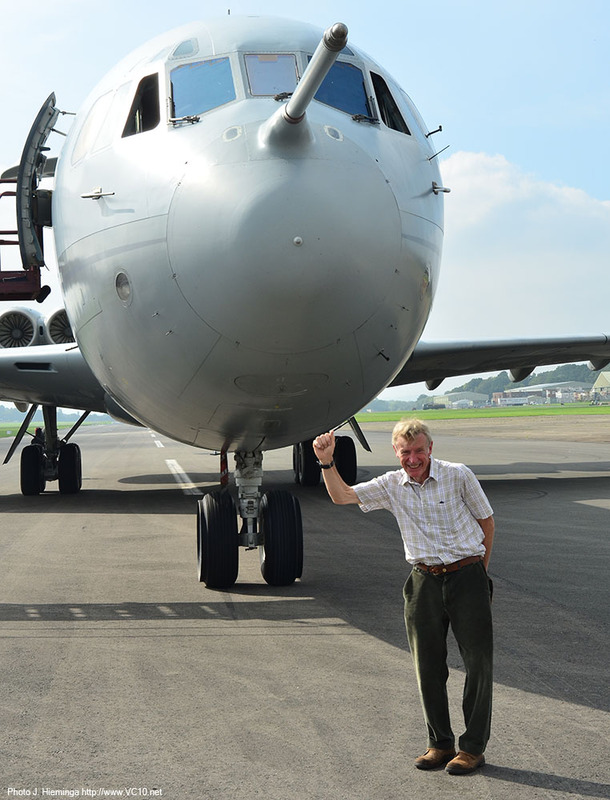 The long awaited new book on the VC10 from Scott Henderson has been announced a while ago, was due out this past summer but has suffered several setbacks on the road to your coffee tables. Just after I typed the previous news item in June the publisher found that there were some issues with the printing quality that had to be resolved first. But now Scoval Publishing is really ready to deliver these books to you VC10 fans. The books arrived at the publisher today and the website has been updated with an order form. The book is available for £45 + £5 p&p in the UK, or free delivery to RAF Brize Norton if you're in the RAF. The deluxe leather bound version will be available in a few weeks time, but get in touch with Scoval Publishing through their e-mail address if you are interested in this. The website (see link above or click here) shows several sample pages from the book on its main page. I hope to be able to review it soon. The team looking after XV108's nose section at East Midlands Aeropark have announced that they plan to celebrate the 50th anniversary of the first flight of XV108, which took place on 7th June 1968, by repainting the nose section in its original 10 squadron colours. This plan has been around since the fuselage was installed at the aeropark but has been brought forward to celebrate the anniversary. The support equipment surrounding XV108's nose already carries the correct colours for a reconstruction of a 20th century scene at RAF Brize Norton. Contrary to earlier reports, there will be an event at Bruntingthorpe on Sunday 27th August, albeit on a smaller scale. Only a selection of jets will perform taxi runs but resident VC10 K4 is included in this line up. Tickets are available at the gate at £15 pp (under 12 years free) but numbers are limited. 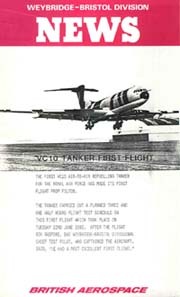 For more, see here: Victor XM715 website. The team that looks after Dunsfold-based ZA150 has just been told by the airshow organisation that the scheduled taxi run for Sunday 27th August will most likely be canceled. Although the aircraft is in perfect shape there are apparently some doubts about this in the minds of the show organisation, which have led to this decision. The VC10 will be present in the static line up and will be open for visits on both days. Let's hope that the difficulties can be overcome so that at least one VC10 can strut its stuff on a runway this August! Having designed many different items for the merchandise catalogue of the ZD241 team, Steve Jones has now come up with a limited edition stainless steel men's watch. 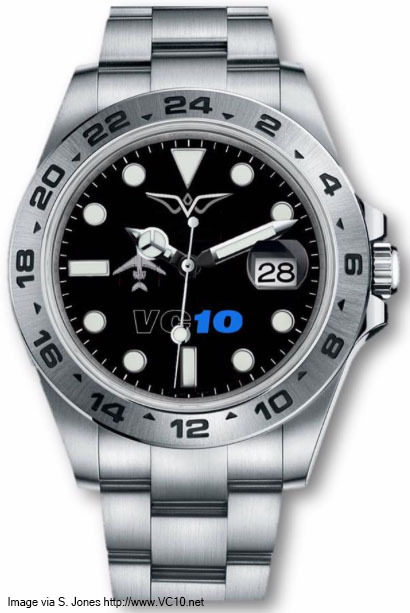 This is based on a waterproof quartz watch and it is customised with the VC10 logo, a top view drawing of a VC10 K4 and a Vickers Armstrongs logo on the black face. Also, the rear cover will be laser etched with a K4 outline and an individual number, only 101 pieces will be produced. The clasp will also have the Vickers Armstrongs logo laser etched on it, as will the black watch box that it comes in. At the time of writing some 40 examples out of the 101 are as yet unallocated, if you'd like one, get in touch with Steve soon. It will retail at £135 including delivery to UK adresses, with the proceeds supporting ZD241's future. Subject to timing, Steve will try to get these watches on board ZD241 for a taxi run down the Bruntingthorpe runway before delivery. You can get in touch with Steve through the Facebook link above, or if you're not on Facebook, send me an e-mail and I will forward this. For more images of these watches, check out the Facebook page through the link above. As there will be no Cold War Jets day this August (see below), those of you looking for some Conway noise will have to visit the Dunsfold Wings & Wheels event on Sunday 27th August. The show runs for two days, on Saturday 26th and Sunday 27th August, and ZA150 will be open for visits on both days. Subject to servicability ZA150 will carry out a taxi run in front of the audience on Sunday only, around 9:30am. Due to business activities at Bruntingthorpe the regular Cold War Jets day in August will sadly not take place this year. There is every intention to hold two events per year but this one will have to be cancelled. If you would like a fix of moving Cold War Jets and are enthusiastic about photography as well then TimeLine events may be able to help you out. On 30th September they have teamed up with the team looking after ZD241, as well as The Buccaneer Aviation Group to offer an afternoon/evening event at Bruntingthorpe during which several aircraft will perform taxi runs and there will be plenty of opportunities to photograph them from all angles and both with and without artificial lighting. To book tickets and for more information see their website: TimeLine Events. On this day 101 Squadron reaches their centenary! Originally formed at Farnborough on 12th July 1917 with the Royal Aircraft Factory FE2b, the squadron has been reformed several times, operating Blenheims, Wellingtons, Lancasters, Lincolns, Canberras and Vulcans. On 1 May 1984 101 Squadron was reformed to receive the first of the VC10 K2 and K3 tankers, later also operating the K4s and of course the remaining C1Ks after 10 Squadron was disbanded in 2005. From October 2013 on it has been flying the new Voyager KC2 and KC3 airframes. On July 15th there will be an open day for ZA150 at Dunsfold. Tickets for this event are limited in number and can be obtained through the Brooklands Museum link above (or below). Between 12:00 and 15:30 there will be a chance to see the aircraft perform a taxi run on the runway and afterwards visitors will be able to visit the inside of the VC10. Tickets must be pre-booked, there is no opportunity to buy these at the gate on the day. 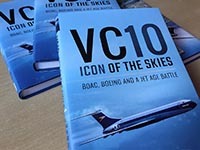 With thanks the generosity of Pen and Sword books I have three copies of Lance Cole's title 'VC10 - Icon of the Skies' to give away to readers of this site. If you want one, send me an e-mail containing your full name and adress, no later than Wednesday, 21st June. I will draw three names at random and will then drop these books in the mail. Update: the three books are on their way to the three lucky winners. The long awaited new book by Scott Henderson is due out soon! Following on from his earlier book 'Silent, Swift, Superb' this new title is a new work that both provides an update and brings to a conclusion the story of the VC10. Containing all new photos this book aims to present the full history of the type in text and images, up to and including the retirement of the last RAF tankers and the move of XR808 to Cosford. The book will be published in a standard version for £45.00 plus p&p, available from the website from 26th June on, and a leather bound limited edition for £100.00, which will be available in July. Keep an eye on the Scoval Publishing website for details on how to order your copy. 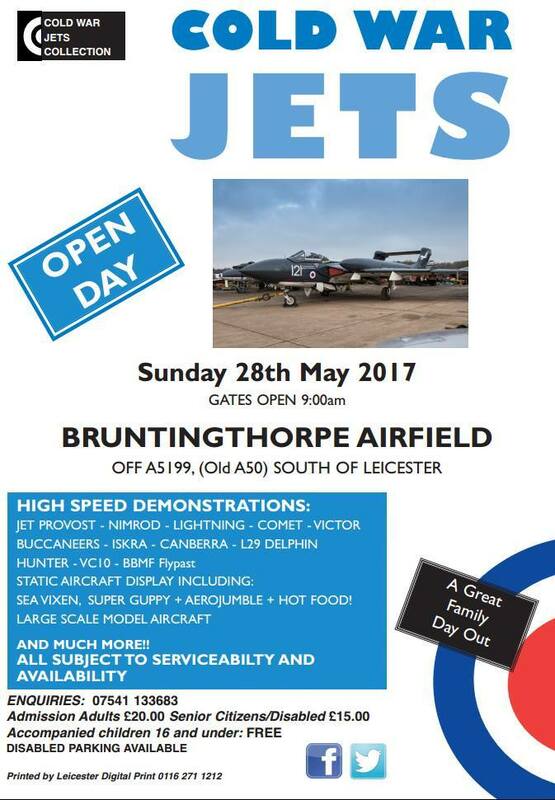 The next open day at Bruntingthorpe is coming up on Sunday 28th May. The gates open at 9:00am and VC10 K4 ZD241 will most likely be the first runner on the program. Afterwards the VC10 will be parked close to the display line. The team looking after her will be on site selling merchandise in support of the continued preservation of this VC10. Next to this obvious highlight, the other active airframes will perform taxi runs, including the impressive Lightnings, there will be a flypast by the BBMF and several large scale model aircraft will fly. At 1:00pm author Keith Wilson will be available on or near the VC10 to sign his Haynes VC10 manual, so feel free to bring your copy along. Terry Mason has been flying a large scale RC model VC10 for several years now but recently this model has been repainted, losing its RAF tanker colours. 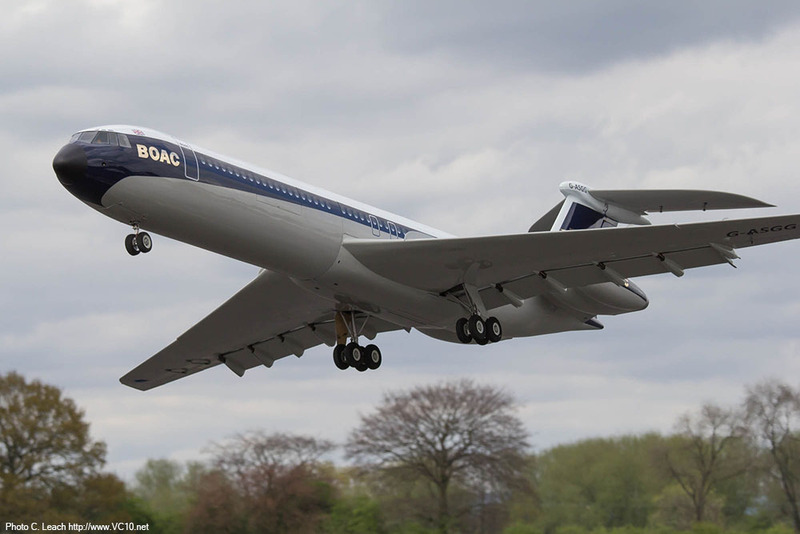 It now represents BOAC Super VC10 G-ASGG in the second BOAC speedbird livery and has performed its first flight in this scheme. The model is still a very impressive sight in the air and it is great to see the iconic blue and gold speedbird livery on it. An impressive photo of Terry Mason's large scale VC10 model during the first flight in BOAC colours. In February 2017 Roden released a new version of their 1:144 scale VC10 kit, this time allowing you to build K4 tanker ZD241 as it is preserved at Bruntingthorpe airfield. The only markings missing on the decalsheet are the GJD Services logos that were applied by its current owner. Lance Cole has written about the VC10 in the past but he has now picked up a new take on its story. His latest title was released by Pen and Sword on 2nd March and covers the political side of the VC10's story. Amazon's page about this book is here, but please note that the reviews are actually about Lance's previous book and they have used an incorrect cover image. Hopefully Amazon will correct this before too long. The press release for this new title is below, a full review for this title is here. Lance Cole's new book about the VC10 and some of its political problems. In a new approach to an established aviation story, Lance Cole frames the plot of one the world's most famous airliners and the toxic tale of its procurement and deployment by Britain's Governments and by its national airline as the British Overseas Airways Corporation – BOAC. The author sets the tale within the 1950s-'60s circumstances that on the one hand, produced the beautiful VC10 yet on the other, signalled the end of large airliner production in Great Britain – in a 'golden age' that was in fact, tarnished by all sorts of machinations and agendas. 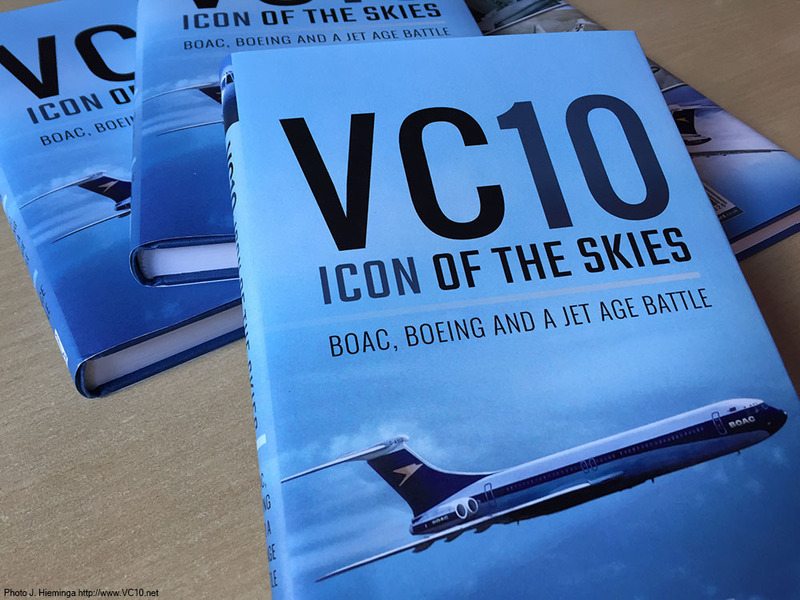 In a book of broader discussion than Cole’s original technical history of the VC10 published nearly twenty years ago, the new narrative ranges from 1919 at Hounslow Heath, to Imperial Airways flying-boats, the Comet and then the VC10. This new book provides the airliner enthusiast and the historian with a fresh perspective of what happened. With contributions from Tony Benn, Brian Trubshaw, Sir George Edwards and his team, and a cast of observers, the book reveals the conflicting and turbulent tide of events that ruined the VC10's chances amid a difficult period for the British aviation industry. The VC10 could operate from difficult airports all over the world – its rivals could not achieve this. But the VC10 was thrown into the battle of the airlines when accountants and 'maximum-payload-range' would dominate affairs and Boeing's mighty 707 and the Douglas DC-8 were airliners built without the constraints of the BOAC route demands. The VC10 and Super VC10 paid the price for their dedicated, thoroughbred design and tropical abilities. The Royal Air Force also framed its own VC10 story to great effect. But only 54 of the VC10 family were built, Boeing manufactured nearly 2,000 of its 707s. So if the VC10 was so good, what went wrong? The answer lies in Britain's history, a mess of political and airline policy and a bizarre set of twists and turns. Well known for his flights in BAC 1-11 G-ASYD and Concorde, Roy Radford also captained the first flight of the K2 tanker variant of the VC10 on 22nd June 1982, together with John Lewis. Roy had been in the RAF since 1946 and flew both Valiants and Victors before taking an ETPS course and joining A&AEE at Boscombe Down. In 1964 Roy left the RAF and became a test pilot for BAC under Chief Test Pilot Brian Trubshaw. 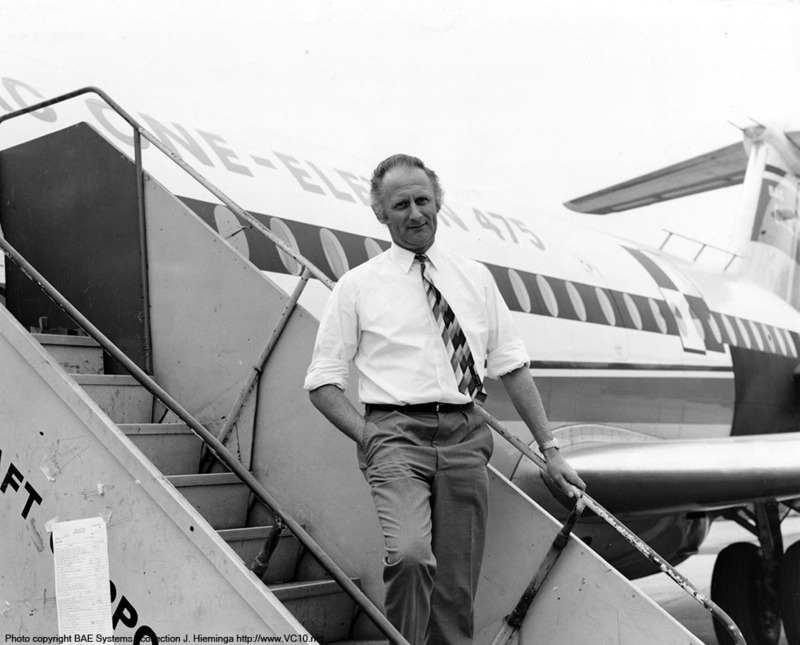 He captained two first flights for G-ASYD and became Chief Test Pilot himself in 1981. In 1985 he became the Flight Operations manager at Filton, a post that he held until his retirement in 1989. Roy Radford passed away on 4th March 2017, aged 88. Official photo of Roy Radford as BAC test pilot with 1-11 G-ASYD. Roy answering questions from the audience at the VC10's 50th anniversary gathering. On Saturday 11th March there will be an open day at Dunsfold Aerodrome for VC10 K3 tanker ZA150. The team that looks after the aircraft will conduct tours of the inside and will also perform a taxi run on the runway. Entry is by pre-booked ticket only, so visit the Brooklands Museum website if you want to get up close to this VC10. Anyone interested in the political background of BOAC's VC10 orders might want to take a look at the latest issue of The Aviation Historian. 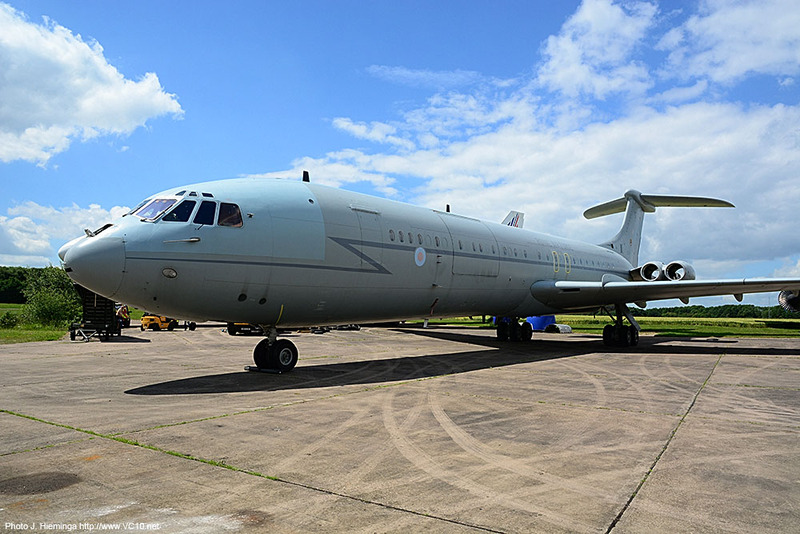 In issue 18 of the quarterly magazine Professor Keith Hayward continues on from his previous articles on the Vickers 1000 and Hawker Siddeley Trident with a good look at the troubled process of the VC10's procurement. For the full story have a look at the back issues and get hold of issue 14 for the story about the Vickers 1000 and issue 16 for the story about the Hawker Siddeley Trident. The Aviation Historian is not available in the shops but only online as single issues or through a subscription. The editors have a lot of experience in aviation publishing and have combined forces to create a unique, high quality and different magazine that features articles that would not normally reach the regular high-street aviation magazines. See the link above for more info or to order your copy.